Sheffield United’s Billy Sharp has made the same squad as Luis Suarez and Sadio Mane, if only for one week. EA Sports has released its FIFA 19 Team of the Week for game week 7 and Sheffield United’s Sharp has made the cut. 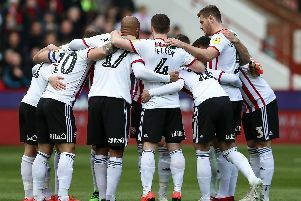 The Blades’ captain hit a hat-trick against Wigan Athletic at the weekend to help Chris Wilder’s side return to the top of the Championship. Sharp’s incredible performance has earned him a place in the reserves while the starting 11 has a whole host of famous names included. Chelsea forward Willian earns a place in the team for his star display in their 4-0 win away at Burnley with Mane the only other Premier League player in the starting 11. Barcelona’s Luis Suarez hit a hat-trick in the 5-1 El Classico drubbing over Real Madrid and he’s joined by Nani and Iago Aspas in attack. EA Sports rounds up the 23 most in-form players at the moment from around the world based on their individual and team performances throughout the week. Sharp now has a new gold card for the week with his rating improved from 70 to 78 overall after his sublime performance.